Patrick wrote his 'Confession' as a kind of 'apologia pro vita sua' to praise God for the wonderful works that he saw done through him. 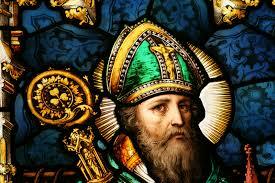 Summary of St Patrick, Bishop, Missionary. Born in Britain probably in the early years of the fifth century, Patrick was taken captive at the age of 16 and brought to Ireland, where he worked as a slave. His captivity led him to a renewal of his spiritual life. After he escaped back home at the age of 22, it was clear to him that God was calling him to return to convert the Irish. After studies in Europe he returned to Ireland, where he made a very large number of converts. His spiritual journey is recounted in his Confessio. 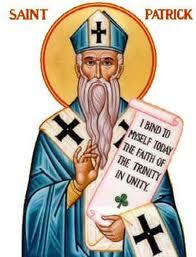 The irony about St Patrick is that, though for long he has been touted as a symbol of Irish nationalism and opposition to Britain, he probably was himself a Brit, possibly from the Carlisle district of north-west England. Here Patrick Duffy outlines his life. Probably originating from a clerical family in the Carlisle district of north-west England, Patrick’s father was a deacon and his grandfather a priest. Captured by Irish invaders, he became a slave, herding sheep on Slemish mountain in Co Antrim. This changed his personality and through the power of prayer (“100 times a day and 100 times at night”) he became totally devoted to God and trusting in his providence. After seven years Patrick escaped on a ship probably to Britain and back to his family. But he felt called to go back on a mission to Ireland. He trained as a monk and a priest, probably first in Britain and then in Gaul. It may have been a British monk-bishop who sent him as a missionary. He possibly sold his patrimony to finance his mission and gain access to Irish chiefs. Patrick probably wandered from place to place in a rural setting especially in the northern half of the country and was highly successful in encouraging young converts to follow him as monks and nuns. When some of his converts were kidnapped by Coroticus’s soldiers, fearing that they would be raped, he excommunicated those responsible, which he may not have been entitled to do and there may have been an investigation. This the context of the second document that survives, his Letter to Coroticus. Patrick probably wasn’t the first misssionary to Ireland. 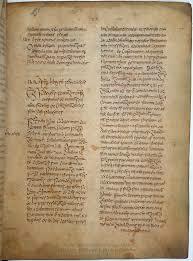 Others who possibly had contact with Christianity in the South of Wales were Kieran of Seir, Ailbe of Emly, Declan of the Déise in Waterford and Ibar or Iberius in Wexford. Places of pilgrimage like Lough Derg in Co Donegal and Croagh Patrick in Co Mayo are traditionally associated with him, as is the Celtic prayer, The Breastplate of St Patrick.